We have a fantastic opportunity in Marion this Tuesday, November 5th. 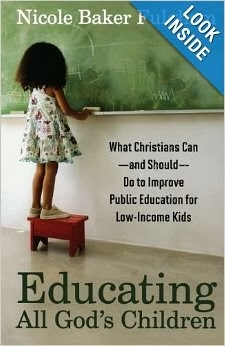 Indiana Wesleyan is hosting an event - an interview with Q&A - with author Nicole Baker Fulgham, who wrote Educating All God's Children: What Christians Can -and Should- Do to Improve Public Education for Low Income Kids. This event is FREE and open to the public. It is from 7:00pm - 8:00pm at IWU in the Student Center in the Globe Theatre. For more info, see below. To register, contact SARA BRADY at 765.677.2437 or sara.brady@indwes.edu. Nicole Baker Fulgham is president and founder of The Expectations Project, a national organization that mobilizes people of faith to support public education reform and close the academic achievement gap. She is the former vice president of faith community relations at Teach for America, has appeared on CNN and ABC News, and was named to the list of “50 women to watch: Those Most Shaping the Church and Culture” by Christianity Today. The symposium is open to IWU students and faculty, and Marion Community Schools teachers and administrators who are concerned about the gap between the ‘haves’ and the ‘have nots’ in American society, and, as Christians, feel a responsibility to do something about it. Symposium activities include a series of chapter discussions leading up to a banquet, followed by an author interview. There will be time available for symposium participants to interact with the author in a question-and-answer session. ∙ The symposium banquet is on Tuesday, November 5 in the Barnes Student Center Henry West Banquet Room, beginning at 5:30 p.m. The author interview begins at 7:00 in the Globe Theater, followed by the Q&A session at 7:30. Please RSVP your interest in the book discussion series, the banquet, or both to Sara Brady in the Teacher Education Office by email at sara.brady@indwes.edu, or by phone at x2437.